As you know, last week was dedicated to the overflow screening of potential orthopedic patients. 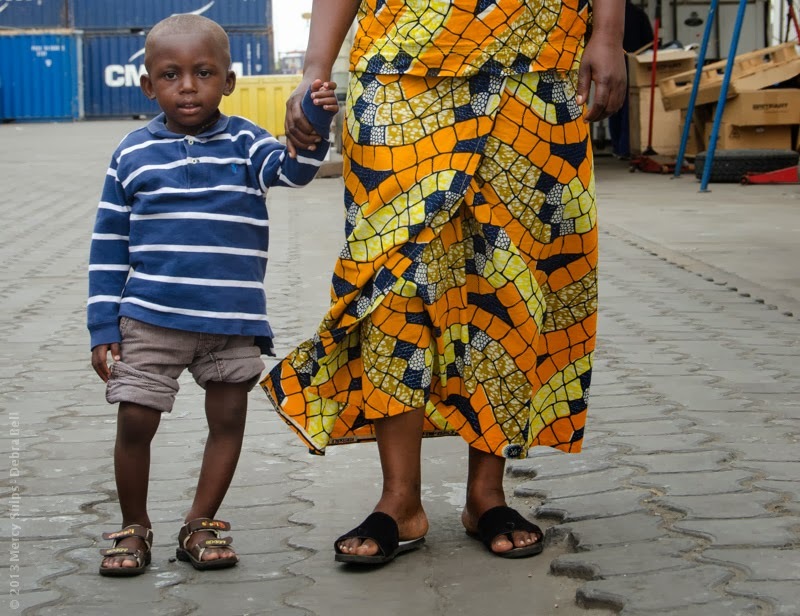 The Mercy Ships’ Primary Screening in Congo-Brazzaville was in August, when over 7,300 people waited in line at a Pointe Noire high school to be evaluated. This was the largest turnout for Screening Day in the organization’s history. 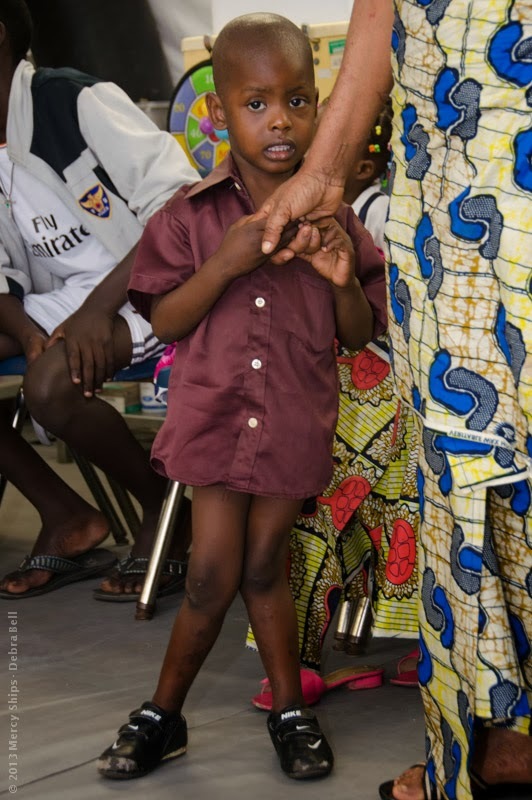 Last week, there were 17 extra orthopedic surgery spots to fill, and the ortho screening team saw almost 50 people who had not made it through screening in August. On Monday morning, I walked down the gangway to the dockside tents to behold an array of colorfully dressed mothers, solemn-faced men, sleeping or crying or smiling babies, straying toddlers, and daydreaming teenagers sitting on the benches. Some were there for post-op appointments; others for general screening. The group I was looking for was of the half-pint variety. Why half pints? 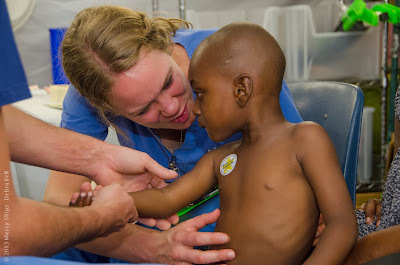 Well, the Mercy Ships only offers orthopedic surgery and rehabilitation to children up to 15 years of age. Any older than 15 and the surgical/healing process becomes worlds more complicated. The inclusion of adults would restrict the hospital’s efficiency and dramatically shorten the reach of the Mercy Ships into the very high population of those in need. The reason is simple: while the orthopedic patients are young, their injuries or genetic malformations have exacted significantly less damage on the surrounding tissue, muscle, nerve and bone when compared to an adult who has lived years more with the same untreated issue. Case in point: a 13-year-old girl with bowed legs walks in for a consultation with our lead physiotherapist, Nick Veltjens. A few minutes before she entered, a girl of 3 or 4 years old was seen for the exact same issue. Nick turns to me as the older girl takes a seat before him: “This is what ten more years looks like,” he says, dispiritedly. I imagine it must be especially difficult for someone like Nick to see these issues so far progressed. In the First World, children with such deficiencies get proper care and attention at a very young age. 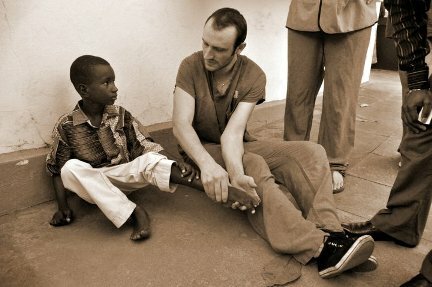 Here, people like Nick and the physiotherapy team must work with pioneering creativity and unfathomable strength to unravel the effects of deficiencies that have been long unrestrained by time or treatment; deficiencies that have deeply engraved their troubles into the bodies, psyches, and life situations of people. It’s a big task for healers. Sitting by the small screening group in the physiotherapy tent, I experience my first “no”. A little boy with big, beautiful eyes and a sheepish smile gets down from his chair and walks over with his mother to the two chairs set up before the screening team. The translator speaks to her in French. She turns to her boy and shimmies off his t-shirt, facing him again to the group. He keeps his left hand to his bottom lip, shyly, not knowing what to do with all these eyes on him. I am having difficulty discerning what it is he is here for until I notice the complete lack of muscle tone in his right arm. I note how he does not use it, and how it hangs limply at his side. The translator relays to Nick what the mother says: how the midwife in desperation had pulled the breeched baby out of his mother’s womb by his right arm. Nick listens, examining the boy’s arm, thinking with his hands. Here, there is no help for this little one. Tell her that I believe God wants her son on this earth for a reason. Tell her that he was pulled out of her womb so that he could live and breathe because he is special, and he has a purpose, and God has a plan for him on this earth. We may not be able to help your boy, but God protects him and will provide the healing he needs in his life. And then they asked her if it would be ok to pray with her and her son. And then they huddled together and prayed—a hand on one another—asking for guidance and protection and healing for the boy. And then the boy and his mother got up and left. The dedication, expertise and faith I’ve witnessed here make a significant mark in me. There is a nobility here that far exceeds the fraudulents of the same name (like wealth or power or reputation)—it’s a nobility of soul: a true chivalry that places aside the self to take on the burly giants of affliction and poverty that torment the souls of countless others. Ok so that was the follow up screening day... I was glad that we eventually got to see everyone that waited so long in line during the first big screening day (even if it was a month or so later).